On-street terminals serving many routes can increase capacity and reduce transit vehicle congestion where multiple routes converge. By grouping routes and spacing stops in a skip-stop configuration, passenger boardings can be dispersed using skip-stop configurations and enhanced boarding platforms for heavy passenger volumes. 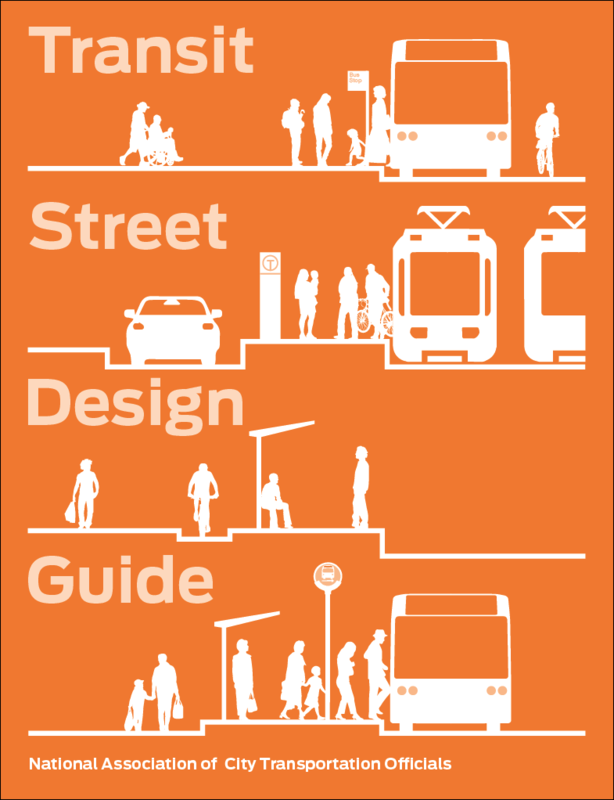 Buses, streetcars, and light rail vehicles can be accommodated in mixed-traffic lanes, or may have dedicated lanes to manage high transit volumes. 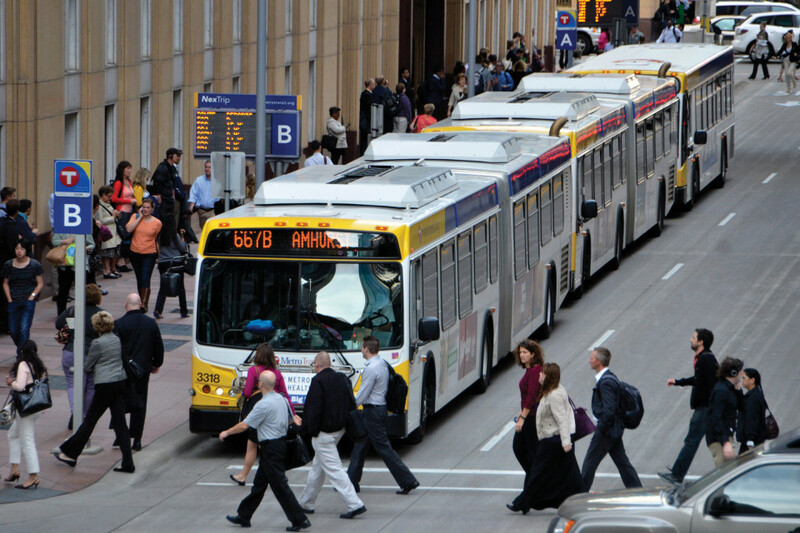 Downtown areas served by a robust transit network can see streets clogged with buses competing for space among other users, including large numbers of waiting passengers. They also may see large volumes of transfers. 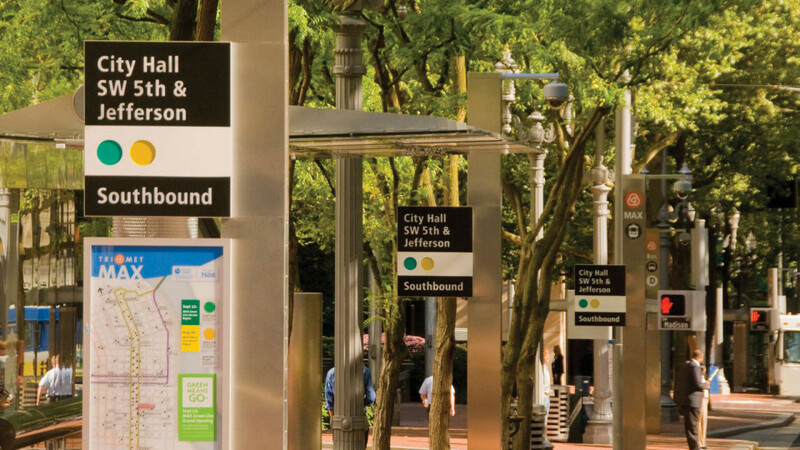 On-street terminals can improve operations along high-volume transit corridors with dedicated lanes, skip-stop siting, and enhanced boarding areas. Reduces conflicts between transit vehicles in corridors with heavy transit volumes along multiple routes. 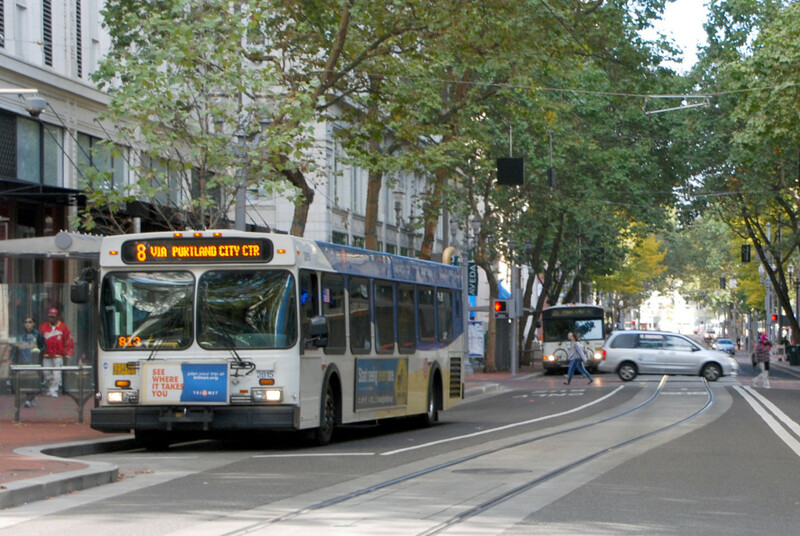 Portland’s TriMet has instituted skip-stop configurations to great effect along its 5th Avenue transit mall, accommodating 175 buses per hour by staggering buses into four groups, placing two stops per block. The street is able to nearly triple its stop capacity by distributing riders among boarding groups. “Ch 6, Bus Transit Capacity.” TCQSM 3rd Edition. TCRP Report 165, Transportation Research Board (2013). Skip-stop placement allows high-frequency bus corridors to serve different routes at groups of bus stops, and distributes waiting passengers along a corridor. Terminal stops facilitate high-volume transfers, so branding and signage are critical to legibility and passenger understanding. Information should be clear, concise, and visible whether it is posted as simple displays or as dynamic real-time information. If bike lanes are present, place them on the opposite side of the street from transit lanes to reduce conflicts from frequent transit movements on one-way streets, or provide high-quality bike facilities on a nearby parallel street. Terminal stops may need additional space to allow vehicles to lay over between runs. Analyze the need for active warning systems, especially if multiple transit modes share space. Transit stop signs must clearly communicate which routes are served at which locations. The on-street terminal must always operate in the curbside lane; to ensure stops remain unobstructed, all other curbside activities must be prohibited on the terminal side of the street. Stop length must meet the criteria of a pull-out stop, though transition lengths may be shared between stops—one stop’s exit taper may act as the next stop’s entry (see page 62). Transit vehicles make stops in the curbside lane, and travel in the offset lane. Stopping patterns should be consistent to aid rider recognition. Signage and maps use letter or color motifs to communicate and reinforce stopping patterns, with each route consistently making stops in the same block location. 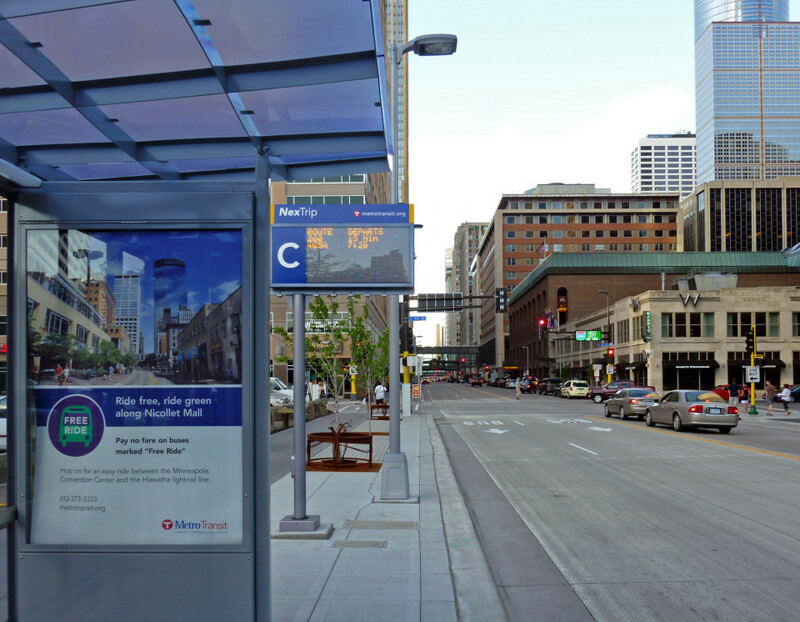 Strip maps, system maps, and wayfinding infrastructure should be consistently and prominently displayed to assist riders in finding correct stop locations. Real-time arrival information should be prominently displayed. References for On-Street Terminal: 1 found.